oh boiled potatoes too...sounds yumm..
Buns looks tremendous..Hope to see you back with bang HC..Wishing you a happy diwali.. These buns look wonderful and I am not surprised by the potatoes as we make doughnuts with potato! Take your time and hope it's nothing serious. Wishing you and your family a happy Diwlai. Take it easy and hope you are doing fine. Awesome! !Looks yummy and delicious..Perfectly baked and nice presentation.Wish u & ur Happy & prosperous diwali. Lovely buns. Wishes for a happy & prosperous Diwali to you and your family. I was blog hopping( like you, as u mentioned) and landed here..very nice to see that you have much less Indian recipe postings than all combined. So nice to know about the food of other places...that is the interesting part...Let me see if I can try some of the dishes I never heard of.. Happy Diwali to u and ur wonderful family. Cham i would still blog, not so often and I just won't be able to visit everybody often. 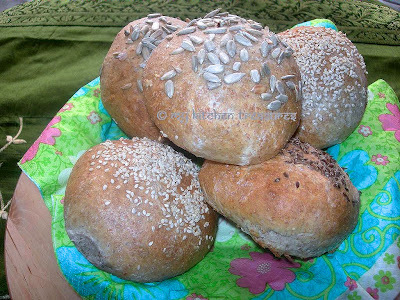 The buns look delicious, love the seeds on top! I hope you are ok, will be checking your blog for all the updates. Those buns look really good. I hope all is well. We all need rest and peace. Last year you commented on my blog regarding the table settings from a charity luncheon. The event just finished again and I just put the first post up if you are interested no comment needed, just enjoy. I love the freshly home baked buns, esp. if with some cheddar cheese, then I can have them for breakfast, lunch and dinner! Oh will surely miss your presence F!..those buns are looking great! These buns looks marvellous Happy Cook! Wonderful for breakfast. Hope everything is OK.
Buns looks so good. Nice recipe. ummm everyone is baking buns these days!!! it looks perfectly baked n yummy. Those buns are melt in the mouth it seems! Buns are looking delicious...and dont worry ..take your time and blog ...we understand personal issues needs more importance..
delicious buns! you have a nice blog.you can visit my blog and give ur comments. buns sound really delicious...with potatoes! Hi Happy, No, this is a charity table luncheon that happens once a year. I volunteer and decorate one table with 8 places. I love doing this. If you go to 'labels' on the right of my blog and click on 'style' it will take you there. My table for this year is actually the 4th post (today) and is a school theme. If you go down you will see last years and my table was 'Diner in Blanc'. I hope you enjoy them, there are a lot of details and great ideas. Looks gorgeous! Would like to grab some..
How beautiful, love bread with seeds. Yummy buns :). Can i use these for making burgers? And that panna cotta is to die for! Sudeshna i am sure you can used them for hamburger buns. Buns look so good! I should be trying potato bread recipes too!! I am in the same state of blogging on & off as u.. staying away, posting irregularly & not visiting blogs. don't know when i can get back to the normal way.